Rowe School students have raised over $65,000 in support of youth experiencing homelessness! Click to read the full story by Julia Penney in Dal News. Katie, Creston and others are sleeping outside for 5 days. 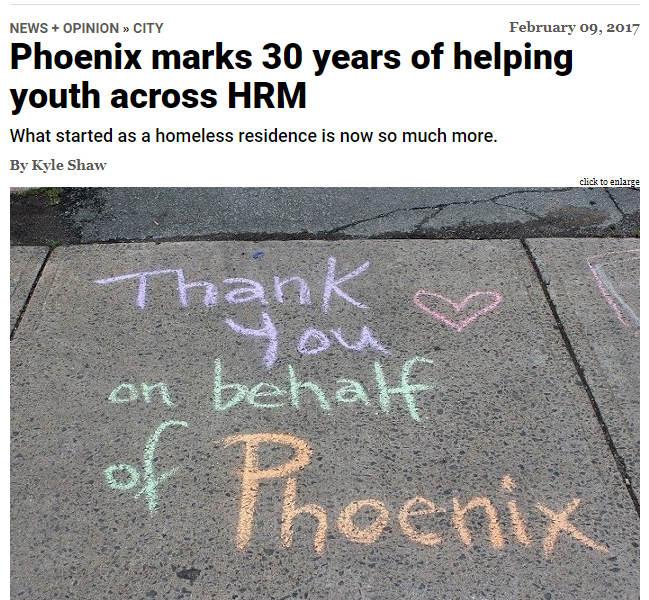 Recognizing that this initiative is very different from the experience of homelessness, the campaign seeks to raise awareness of and funds needed to fight homelessness. Thank you Global Halifax for helping us share the message. Big props to the Dalhousie Commerce Society for this partnership to support youth, now in its 5th year! To celebrate Phoenix Youth Program's "birthday" we partner each year with The Big Sing in Halifax to bring the community together in song. In 2018 approximately 260 people came to St. Andrew's United Church in Halifax to learn and sing Justin Timberlake's "Can't Stop the Feeling" in three part harmony! Why? Because youth, families and community matters! Big thanks to The Big Sing team, St. Andrew's United Church, Rod Sneddon, Daniel Goodbaum and everyone who came out to sing-e-brate.